One of the first things you need to understand if you plan on studying in Australia is that the country may be a little different from your own. Many first time travellers to Australia become confused with the idea of states and territories, which is completely understandable. Australia is geographically the world’s sixth largest country, with more than 7.69 million km2 of land. However, it is home to only 24.6 million people, which means that Australia often has more natural beauty than people! As such, Australia has been divided into states and territories, but still has a lot of fun and adventure to offer! Australia is a federation of six states and ten federal territories. Confused yet? That’s ok! We have provided a short guide to understanding the differences between the states and territories. The main difference lies between the governing powers of the states and territories, and this division was made to help with administration. 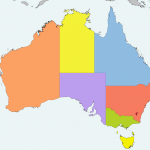 The Australian states were separate even before Australia’s federal government was created, so these states have their own state governments, whereas territories are under the control of the federal government. New South Wales (NSW) is Australia’s oldest state and contains the most populated city in Australia, Sydney. Even though Sydney is the most famous city in Australia, and has even hosted the Olympic Games in 2000, it is not Australia’s capital, which it is often mistaken for! NSW also has more than 780 national parks and reserves, covering 8% of the state. These parks range from rainforests, waterfalls and marine wonderlands, to rugged bushland and outback deserts. Popular activities in NSW are hiking, bushwalking, sightseeing and admiring the remarkable blue-hazed skies, dramatic cliffs and deep canyons of the region. On top of this is the picturesque coastline of NSW, which is a great place to learn how to surf with local experts. Whenever exploring the beaches, make sure you always swim between the flags and follow our safety tips for exploring Australia’s beaches. Queensland is Australia’s second largest state in size. Brisbane is the state’s capital, which has more sunshine and warmth year-round than most Australian cities, making it great for outdoor activities. Brisbane is also within a 1 – 2 hour driving distance of the Gold Coast or the Sunshine Coast, which have (arguably) some of the best beaches in the world. Victoria is the smallest of the mainland states in size, but is home to the country’s second most populated city, Melbourne. Some major tourist destinations include Melbourne Zoo, Melbourne Museum, the Melbourne Aquarium, Melbourne Docklands, Southbank and more. It is also home to some of the world’s leading cultural and sporting landmarks, such as Arts Centre Melbourne, the East End Theatre District, the National Gallery of Victoria and the Melbourne Cricket Ground. Another fascinating icon is the Eureka Tower, with the highest observation deck in the Southern Hemisphere! South Australia’s capital is Adelaide, known for being a great base for exploring wineries. It is also known as the ‘festival state’ as it has more than 500 events and festivals every year. South Australians are known for being football enthusiasts with “Australian Rules” football (AFL) being the most popular sport in the state. Tasmania is the smallest state and is separated from mainland Australia by the Bass Strait. 20% of Tasmania is covered by national parks and wilderness, abundant in driving routes and walking trails, with one of the most mountainous island terrains in the world. While nature and wildlife are amazing, attractions such as Launceston City Ghost Tours, Cadbury’s Schweppes Chocolate Factory, and West Coast Wilderness Railway have even more surprises. Western Australia is a place of extremes with the desert in the east and the scenic coastline in the west. Western Australia is also home to one of the country’s leading performance training institutions in the acclaimed Western Australian Academy of Performing Arts (WAAPA), as well as a growing theatrical and musical scene. The Australian territories are not part of any state. Unlike a state, territories do not have legislations to create laws for themselves, so they rely on the federal government to create and approve the laws. Territories are not claimed by any state so the Australian Parliament directly controls them. Australian Capital Territory is home to many important national institutions including Parliament House, the Australian War Memorial, and the National Gallery of Australia. Northern Territory’s capital is Darwin and has Alice Springs as its principal inland town. Alice Springs is the physical heart of Australia, almost exactly at the nation’s geographic centre. The Northern Territory is home to the famous Uluru (Ayers Rock,) Kata Tjuta (the Olgas), and Kakadu National Park.